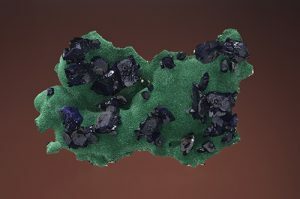 Cuprite, Milpillas Mine, Cuitaca, Santa Cruz, Sonora, Mexico, 5 x 2.5 cm. Arkenstone Specimen. Milpillas was discovered in 1978 and languished for nearly 30 years under low copper prices and formidable obstacles to putting it into production. 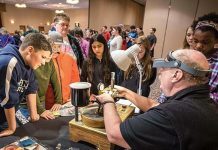 No one suspected it held the greatest find of azurite crystals in history, with killer associates including superb cuprites and the world’s finest brochantite and volborthite. 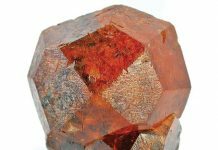 The degree of crystallinity for all these species is exceptional – rivaling nearby Bisbee or distant Tsumeb – and for 10 years magnificent specimens flooded into the market. In 2015, the last of the “green copper oxide ores” were exhausted and the bonanza came to an end (Jones and Megaw, 2017). prolific Cananea district. Like most such deposits it underwent oxidation, which leached copper from widespread disseminated copper mineralization and redeposited it as a concentrated layer of malachite, azurite chrysocolla, cuprite, and chalcocite. Most Porphyry Copper Deposits in the region were recognized and mined starting more than 100 years ago, but Milpillas got hidden by post-oxidation faulting that dropped her down into a trough (graben) beneath the surrounding areas. The trough filled rapidly with loose rocks and sand washed down from the flanking highland, and the secret of Milpillas’s azurites was buried under 250 meters of what geologists call alluvium. As it develops, discovery of Milpillas was accidental! Rocks indicative of porphyry copper deposits were found in the gravels above Milpillas, and a drilling program was undertaken. Copper was struck almost immediately, but it was quickly realized that the altered cobbles came from somewhere else (that remains a mystery). 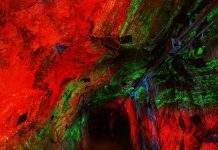 Nonetheless, the discovery was made and eventually was fleshed out to justify building the mine. The gravels figured prominently in the decision to develop the mine because the engineers had to figure out how to dig through 250 meters of poorly consolidated alluvium filled with water to within about 150 meters of the surface. Only high grades and high profitability could support this kind of development and fortunately Milpillas’s 4% copper grade and $3.50 copper prices worked. After three years of development, the mine reached ore, with production beginning in 2006. Almost immediately, a few nice azurites were discovered and smuggled out by the miners. These continued to trickle out through 2007, when a series of larger finds were made that caught the collecting world by storm. 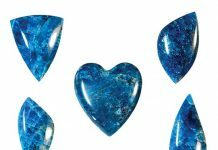 The first electric azurites emerged, with their flashes of brilliant blue, as did spectacular rosettes of coarse azurite crystals on a bed of velvet malachite. Over the next five years, one major pocket after another was found, producing the world’s widest range of azurite colors and habits, along with some of the best malachite pseudomorphs after azurite ever imagined. The flood culminated in 2013-2014 with the “watercourse pocket,” which yielded thousands of specimens of sharp, slightly curved crystals averaging 1.5 cm. 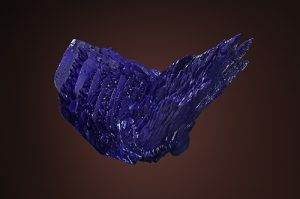 Azurite production started slacking off then, but a transition to copper sulfates began, with the best brochantites ever seen emerging in fair numbers. These included elongate gemmy emerald green needles to 10 cm and stubbier robust deep green crystals to 3 cm with well-developed chisel-like terminations. As if that wasn’t enough, in 2014 a single pocket was hit containing 3 cm rosettes of pistachio green volborthite covering elongate azurite crystals – easily the best volborthite ever seen. 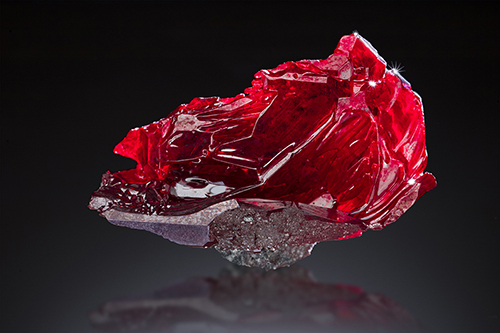 Sulfates then gave way to oxides and sharp skeletal crystals of gemmy blood red cuprite were found, forming maze-like coatings and single crystals up to 2 cm. At last in 2015, the mine transitioned into chalcocite-dominant sulfide ores and specimen production came to a screeching halt. Mining since has ignored the small amounts of oxides left behind. 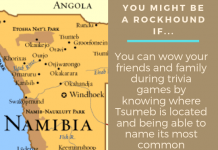 It is unlikely that more azurite-rich ores will be found or that they will compare with what has already been found, but exploration is ongoing and may get lucky. At the least, collectors active over the last 12 years will always be able to say they remember the Milpillas Azurite Bonanza – let’s hope they all got a physical reminder (specimen) to remember it by.